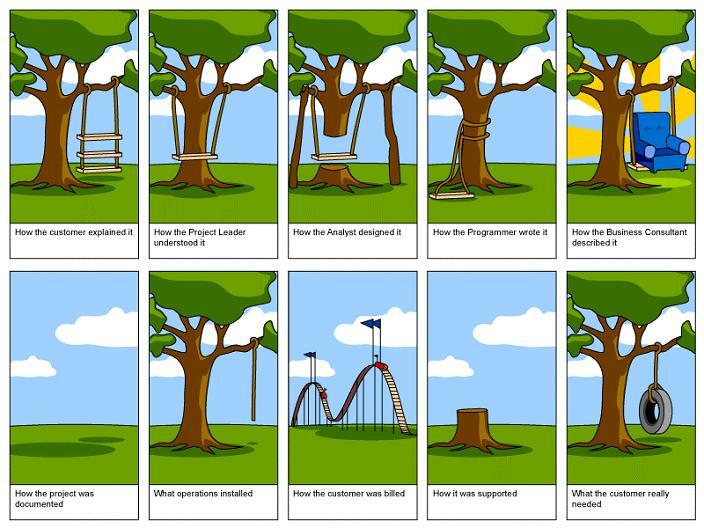 When Dova first asked to get a platform swing for the yard, I immediately thought of this cartoon that always floated around the office. Has to be fun fun fun!! The distance between our trees was 10 feet, and the circumference of each tree was approximate 5 feet each, so we choose a set of two 12 feet tie-down straps, which covers the 20-foot total length (distance between trees plus the two tree circumferences). Each tie-down strap will wrap around a tree and connect to the other tie-down strap in the center, so select a total tie-down length according to your tree distance and circumferences. Make sure the rating of the straps is over 1000 lbs. This swivel is relatively inexpensive compared to a ball bearing swivel. With a little Teflon lubrication, it worked plenty well for this swing. Use two of these 5/16" quick links. Use two of these 1/4" quick links (or get two more of the larger size). The hardest part is to figure out how high to install the tie-downs on the trees. As with most engineering projects, it's an iterative process. We must have tried at least 3 or 4 different heights! The bottom of the swing ended up just shy of 3 feet from the ground, fine for our kids to hop on by themselves. First, wrap the long strap of the tie-down around the tree. Install one of the 1/4" quick links in the webbing loop used for the hook and then pull the long free end through the link. We first tried looping through the hook only, but that wasn't strong enough as the hook was just held together with the plastic coating. Install the ratchet part of the tie-down to the end of the long strap so that it ends approximately halfway between the trees. Do the same with the other tree and then attach the two ends using one of the 5/16" quick links through the sewn loops. From the quick link in the center, attach the eye swivel and then the other 5/16" quick link below it. Finally, attach the rings of the swing to the lower quick link. From the customer reviews of the swing, I made a few safety changes to the swing. The slip knots attaching the hanging ropes to the swing frame were changed to figure eight knots. At the top, tie-wraps were added beneath the rings to prevent the swing from tilting side to side. Big enough to hold at least two people - check! Can swing and spin - check! Mounted between two trees in the yard - check! Does not damage the trees (no drilled holes) - check! Oh yeah, we rocked it! Thanks for posting this alternative to drilling holes and installing a cross beam. I will be installing ours this weekend. This is exactly what I’m trying to do for my kiddos. Wondering how this system held up for you? Anything new you would suggest? We've put the swing up for several years now and it works perfectly every time. I wrap a piece of yarn around the tree so we know where to re-install it every spring. Other than that, this design really works! Thank you for the recent response, everything was really dated that I found. I brought this same swing with the same intent. Do you mind me asking how far you did go up the tree? The tie downs are attached to the trees approximately 8.5 feet off the ground. I'll remeasure when we put it up again. We usually use a 7-foot step ladder to install it each year, which give a comfortable working height to install the tie downs and reattach the swing in the middle. With this swing, 8 feet between trees should be enough room to swing. You basically have about 2.5 feet on each side and would have to purposely swing sideways to be able to hit. With 10 feet between trees, we never come close to the trees. The straps don't move on the tree at all, but they do sag a bit in the center with weight and basically swing back and forth with the swing. We take the swing in during the winters just to keep it out of the elements (snow, ice, etc). We've had the swing now for 4 seasons without issues!